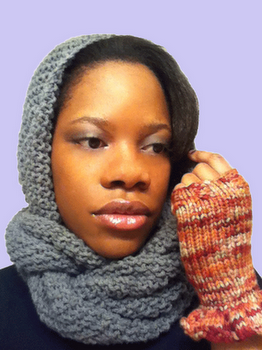 Due to popular demand, I’ve decided to re-blog this post, and this time I wrote a pattern! Huzzah! The trick to knitting the ruffle is to start with 3 times the number of stitches needed and decrease rapidly. The mitts are knitted from the bottom up. Cast on 90(108, 126) stitches on to circular needle. Place marker. Be careful to not twist stitches. Join. Knit all rounds until tube measures 1.5 inches (2 inches, 2.25 inches) from the cast on edge. Transfer stitches to 3 (US 9) dpns, making sure that there are an even number of stitches – 10(12, 14) on each DPN. Slip first 5(6, 6) stitches onto scrap yarn and reserve. Knit remaining stitches. 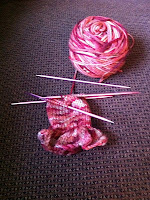 Continue knitting hand until piece is 0.5 inches short of the desired length. Transfer stitches to 3 smaller dpns and place detachable stitch marker on last completed round. K1, P1 until piece measures 0.5 inches from the detachable stitch marker. Bind off Hand in rib. Weave in ends on Hand. Slip the reserve stitches off scrap yarn and onto 2 (US 9) dpns. Rejoin yarn and knit the previously reserved stitches. Pick up and knit additional 6(6, 7) stitches from base of where thumb and hand meet. Be sure to keep these stitches tight so that no holes appear in your work. Redistribute the 11(12 ,13) stitches as evenly as possible on 3 (US 9) dpns. Knit 4 to 6 rounds for the thumb before knitting thumb ribbing. Transfer thumb stitches to 3 smaller dpns. K1, P1 for four rounds. Bind of thumb in rib and weave in ends and any gaps between thumb and hand. Repeat for all steps for the second hand.